Oxycalcioroméite: Mineral information, data and localities. Named according to the recommended pyrochlore supergroup nomenclature (Atencio et al. 2010), indicating dominant elements and its relation to other roméite group minerals. The Ca analogue of cuproroméite and oxyplumboroméite. One of the most simple Ca-Sb minerals. It originated from hydrothermal fluids related to Alpine metamorphism of greenschist facies. The Museo di Storia Naturale e del Territorio, Università di Pisa, Calci (Pisa), Italy, catalogue number 19640.
dolostone lenses within the barite-pyrite-magnetite-hematite ore body, at the contact between metavolcanic-metasedimentary Triassic schists, dolostone, and Lower Jurassic marbles. 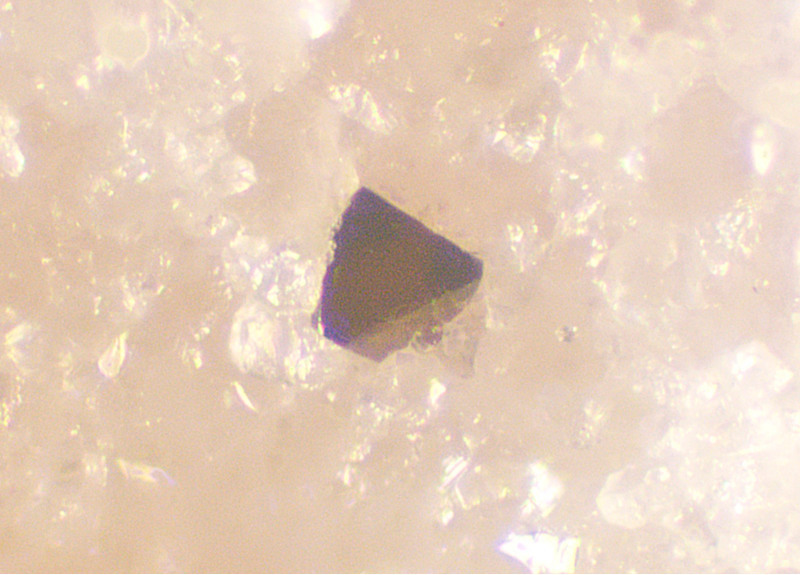 Christy, A.G. and Gatedal, K. (2005) Extremely Pb-rich rock-forming silicates including a beryllian scapolite and associated minerals in a skarn from Långban, Värmland, Sweden. Mineralogical Magazine: 69: 995-1018 [as roméite]. Biagioni, C. and Orlandi, P. (2012) Oxycalcioroméite, IMA 2012-022. CNMNC Newsletter No. 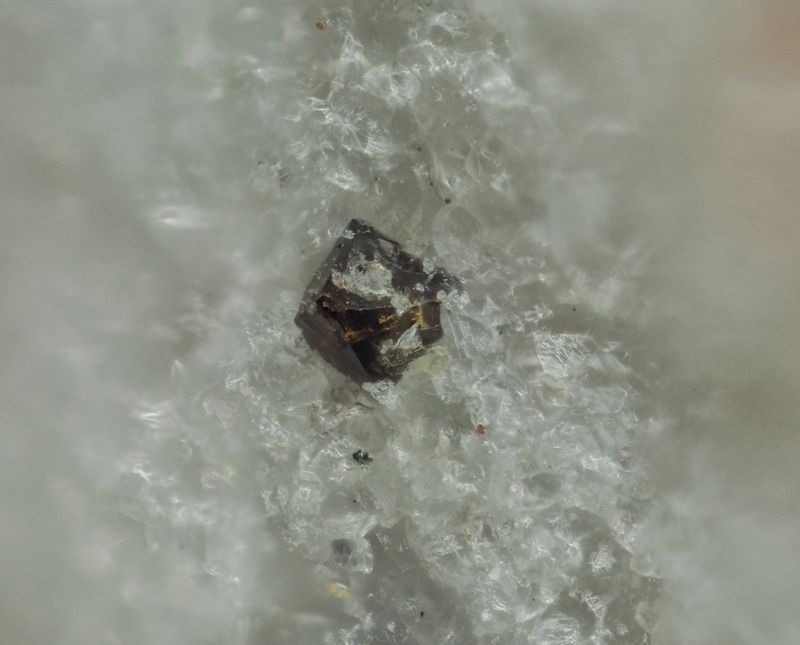 14, October 2012, page 1283; Mineralogical Magazine: 76: 1281-1288. Biagioni, C., Orlandi, P., Nestola, F., and Bianchin, S. (2013) Oxycalcioroméite, Ca2Sb2O6O, from Buca della Vena mine, Apuan Alps, Tuscany, Italy: a new member of the pyrochlore supergroup. Mineralogical Magazine: 77: 3027-3037. Belakovskiy, D.I., Cámara, F., Gagne, O.C., and Uvarova, Y. (2015) New mineral names. American Mineralogist: 100: 2352-2362. Kolitsch, U. (2017): 2039) Allanit-(Ce), Cerianit-(Ce), Cheralith, Chernovit-(Y), Mineralien der Pyrochlorsupergruppe, Columbit-(Fe), Columbit-(Mn), Uraninit und weitere Mineralien aus einem Pegmatit im Blocherleitengraben im Mieslingtal bei Spitz, Waldviertel, Niederösterreich. Pp. 256-259 in Walter, F. et al. (2017): Neue Mineralfunde aus Österreich LXVI. Carinthia II, 207./127., 217-284. Biagioni, C. and Orlandi, P. (2012): Oxycalcioroméite, IMA 2012-022. CNMNC Newsletter No. 14, October 2012, page 1283; Mineralogical Magazine, 76, 1281-1288; Biagioni, C., Orlandi, P., Nestola, F., Bianchin, S. (2013): Oxycalcioroméite, Ca2Sb2O6O, from Buca della Vena mine, Apuan Alps, Tuscany, Italy: a new member of the pyrochlore supergroup. Mineralogical Magazine, 77, 3027-3037. Christy, A.G. & Gatedal, K. (2005): Extremely Pb-rich rock-forming silicates including a beryllian scapolite and associated minerals in a skarn from Långban, Värmland, Sweden. Mineralogical Magazine: 69: 995-1018; Atencio, D., Andrade, M.B., Christy, A.G., Gieré, R., Kartashov, P.M. (2010) The pyrochlore supergroup of minerals: nomenclature. The Canadian Mineralogist: 48: 673-698.
ⓘ Fianel (Fianel Mine) ? Roth, P. & Meisser, N. (2013): Die seltenen Mineralien der Bündner Manganvorkommen. Schweizer Strahler 47 (3), 8-21 (in German and French).